Santec has developed and supplied Transfer rubber moulding presses, 'H' frame type duplex press with common power pack, Four pillar upstroking compression moulding presses up to 400 M.T. 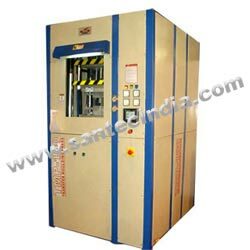 We are in a position to supply Rubber moulding presses with vacuum System arrangement as per customers requirement. We can supply Rubber moulding presses against customers requirements i.e. Four pillar, Plate Type Manual operation, as well as push button with controls through PLC. Santec's rubber moulding presses have compact design ensuring easy operation & maintenance. These presses are simple, sturdy and high rigidity to ensure minimum deflection & long die life. These presses are in variety of constructional options i.e., with Multidaylight Duplex press/Battery of presses with common power pack Electric/Thermic/ steam heating in combination with safety requirements for modern production norms.